My oh my how big can a belly grow???? The answer is: A LOT!!!!!! 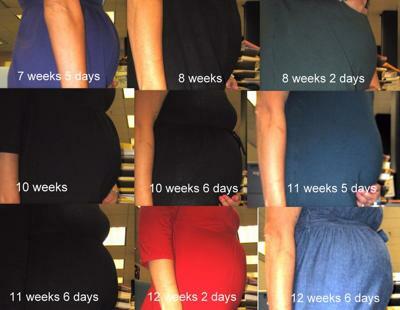 How far along where you when you had to start wearing maternity clothes. I'm 6 weeks pregnant with twins. The first day of my last period was Dec 30, 2012 I found out I was pregnant a couple weeks ago. I havent got a ultra sound done yet but the doctor estimated my due date to be around October 6th. I went in on 02/10 and got a blood test done for my HCG levels and they were 2,546 Then I went back on 02/12 and got them tested agian and they were 5,070. Im guessing im 6 weeks and 4 days along. Do these seem high for being only that far along? And is it possible I can be carrying twins? Ive already grown out of my pants and look like im 5 months pregnant!